So I have a crush. And not a little one. A BIG one…a huge, gushy, get red, giggle, snort, blow chocolate milk out of my nose kind of crush. His name…. Pumpkin…that’s Mr. Pumpkin. Ya….you know him. You all love him. He’s like the Matthew McConaughey of fall produce. Whatever he is in, it’s golden, perfect, never disappoints and always shirtless. Such is my crush….mmmmm pumpkin. I’ve been collecting and dreaming about amazing recipes: pumpkin bourbon ice cream, pumpkin bars, pumpkin bread, pumpkin coconut soup, pumpkin latte, pumpkin butter, pumpkin oatmeal, pumpkin pancakes, pumpkin smoothie, pumpkin cheesecake, pumpkin curry. The list goes on and on and on and on, people. It’s bad. I’ve got a pumpkin fever! 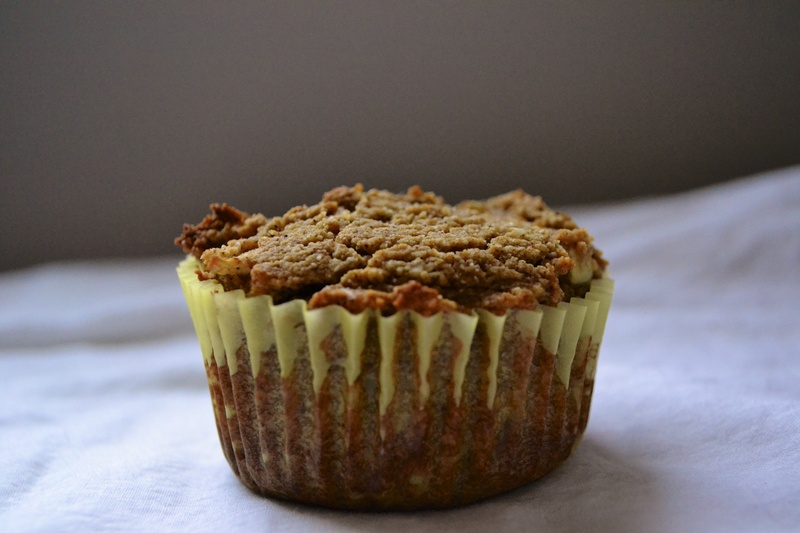 And then I stumbled upon this great pumpkin muffin recipe made with almond flour. As soon as the calendar hit September 1st, my oven went on and in went these delicious pumpkin muffins. I had just picked up some local golden delicious apples at the market and decided to throw one into the mix. I’d been dreaming of these puppies and boy howdy they did not disappoint…much like Matthew McConaughey. Pull the muffin liner off and they too will be shirtless. Whoah! 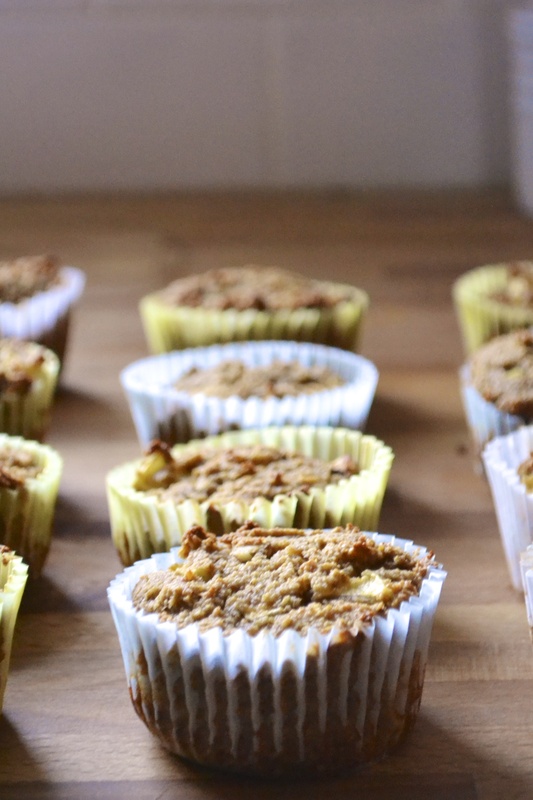 I honestly have to say these are hands down the best pumpkin muffins I have had…gluten free or not. It’s a double bonus that they are not only gluten free but grain free. So if you are on the fence about experimenting with almond flour, give these puppies a go. You will forever be in deep smit. You can even eat them shirtless. I won’t tell. I should note that I made these with my newest purchase of Honeyville blanched almond flour. I’m super impressed with the light texture. Trader Joe’s offers almond meal and it is made from unblanched (skins still on) almonds. Bob’s Redmill also sells almond flour. Although Bob’s is blanched, it has a more coarse texture but still tastes gooooooood. So if you are looking for a lighter texture to baked goods, I’d invest in a better almond flour such as Honeyville or go to Nuts.com. Store your flour in the fridge or freezer. I also think Whole Foods offers bulk almond flour. Another option is to regrind Bob’s almond flour in a coffee grinder. Just be careful to not let it process to long or you will end up with almond butter. DOH! Preheat oven to 350F. Spray 12 cup muffin tin or place muffin liners within tin. Set aside. 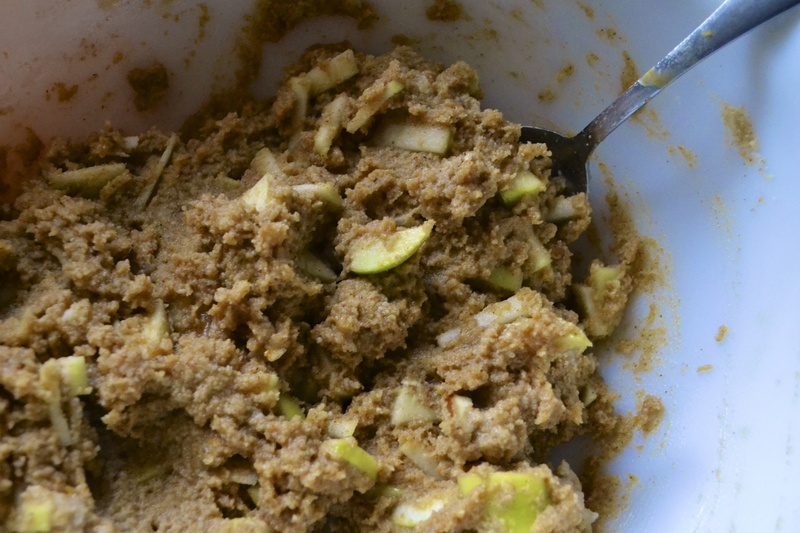 In a large mixing bowl, combine wet ingredients (eggs, pumpkin, maple syrup, coconut oil, and applesauce). Combine until well mixed. Add diced apple. Set aside. 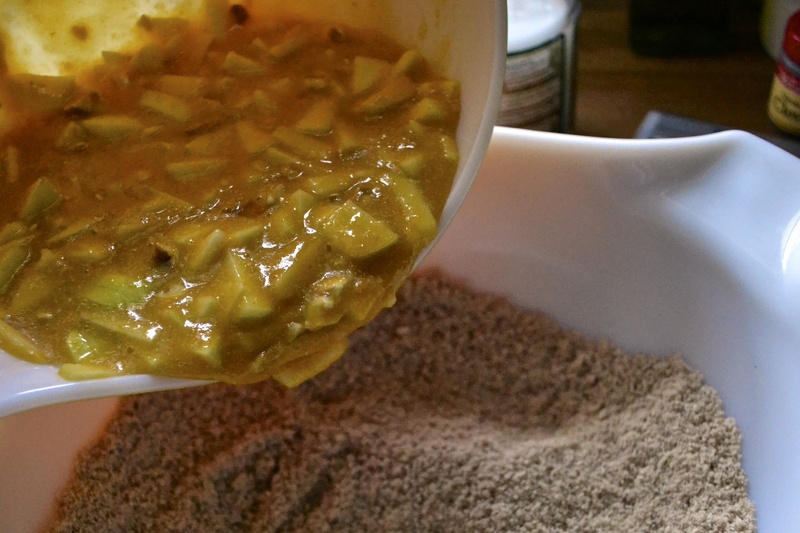 In a separate bowl, combine dry ingredients (almond flour, baking soda, salt, and spices). If you do not have blanched finely ground almond flour, you may need to regrind your almond flour in a blender. Add the dry ingredients to the wet ingredients. Mix until combined where there are no visible lumps. Add nuts and mix until combined. The batter will be rather thick. Spoon the batter into the prepared muffin liners or muffin tin. Fill to about 2/3 full, smoothing the tops with the bottom of a spatula or spoon. Bake in 350F preheated oven for 25 to 30 minutes or until golden brown. Check doneness by inserting a toothpick into the center of a muffin. It will come out clean when done. Allow to cool on a rack, if you dare. Dive in. These freeze well. I’ll give you some of my almond flour to try. And I’ll bake you up a batch of these. We can eat them in my ladies parlor! Awesome! These are totally a ladies parlor kind of treat! I LOVE the way you write, Alyssa. Thanks for the morning laugh. I’ll never remove a muffin liner again without that “shirtless” image! I keep trying to get Mr. Pumpkin to agree to marry me but he wants to play the field! And who am I to blame him with everyone being obsessed with him right now. 😛 Love the sound of these muffins! Hahahaa. You are quite right….I have quite a thing for Mr Butternut too. Ol squashy pants McGee is good any day of the week. Beautiful blog! I’m a pediatrician with a nonprofit that tries to teach families to eat a healthier, plant-strong, whole food diet. I just kid-tested this recipe and put it on my blog, doctoryum.com (I gave you a shout!). Stop by and check out how the kids liked it. I have a few more coming over to test them. Thanks so much for a great recipe!!! I’m so glad you liked them. I love that you are teaching families great food choices and techniques to provide their families with healthy food. So awesome!!! These are delicious! I made a double batch a couple of weeks ago and loved them. They were a big hit with family members young and old(er). 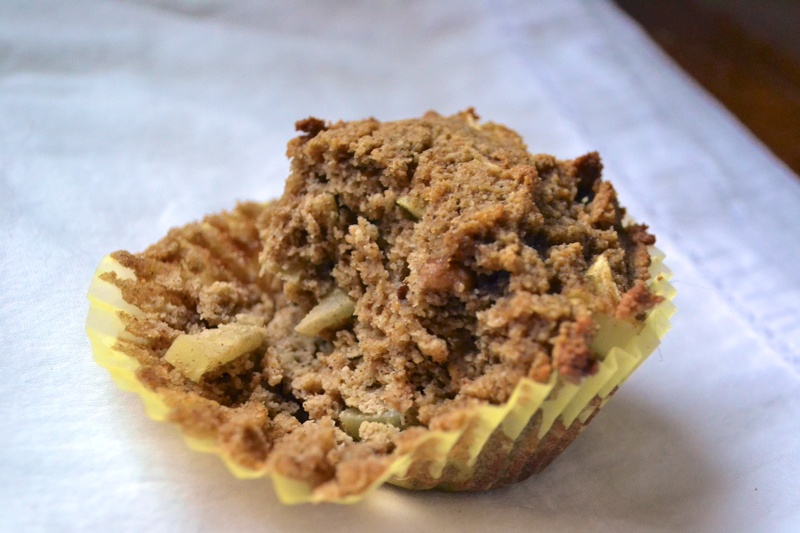 I’ve been cooking with almond flour for a couple of years now and this is my new favorite muffin. I have another double batch in the oven now and I am looking forward to trying some of your other recipes! I’m so glad you love these muffins. They are my favorite as well! Made these for a pumpkin-carving party this afternoon – delicious! The Matthew McConaughey comment is hilarious. 🙂 I made these for my decidedly non-Paleo family and everyone loved them! I’m making another batch to take to a friend tomorrow. Thanks for this great recipe. Would it be alright if I posted it on my blog, with credit and links to you and to Urban Poser? I’m so glad everyone loved them! Yes, great food and recipes must be shared!